When it comes to roofs, we do it all. Whether you need a thorough roof cleaning to remove moss, or if you need roof maintenance or repairs, we are ready and willing to assist you. A good roof cleaning from time to time will stop the build-up of lichen and moss. If these are left untreated, they can block your gutters and pipes. It’s vital that you catch these things early before they get out of hand. One of the most common, costly and often ignored household maintenance projects is the roof over your head. Unless you’ve had water dripping on you, it’s easy to put it on the back burner until the problem gets worse and really takes a bite out of you and your bank balance. Read our quick guide about roof maintenance to find out what you need to do to protect your roof and home. Regular inspection is the key to looking after your roof as it will detect small, inexpensive problems and fix them before they become big and expensive. 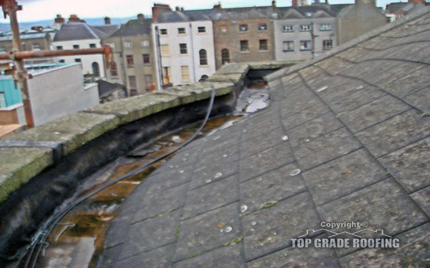 Ideally, roofs should be inspected twice a year at the start and end of winter and after any significant adverse weather like high winds or storms. Check for signs of deterioration such as cracks in tiling, mortar debris, wet spots, or other signs of excessive moisture or deterioration. Look for cracks in a wall as it could indicate possible cracks in the roof system or flashing. Are overhangs, facials and eves in good condition? 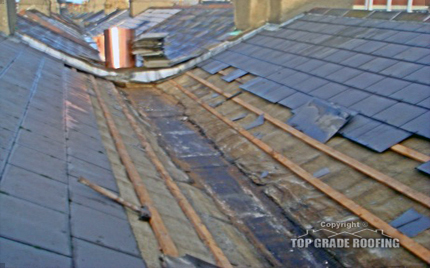 Fractures in the roof eve can cause leaks and let wind and rain get under the roof membrane and cause problems. Are gutters and downpipes free of debris? Damaged or clogged gutters and downpipes can cause water to back up on the roof and lead to water ingress. From inside, look for damp patches on upstairs ceilings or light between the loft rafters. This could be a strong signal of a leaking roof. Inspecting your attic might sound like a chore but it can save the expense and inconvenience of internal repairs to your ceilings and wall coverings after heavy rainfall. 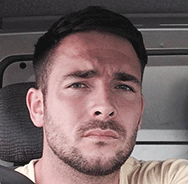 The things to look out for are dampness around the chimney breast, rafters and underlay membrane, or any sign of deterioration, staining or tears in the membrane. Check if you need to trim back any overhanging tree branches. From time to time when leaving out the bins or mowing the lawn, have a quick look up at your roof. You don’t have to be an expert to see a dislodged tile or a dangerous ridge tile resting in your guttering system. It’s all about attention to detail, especially with older buildings. If you are worried about some aspect of the roof or just wants peace of mind before the winter, use an experienced roofer to carry out a full inspection. The key is to detect and repair any defects before it allows moisture to enter the roof system or interior. From a financial standpoint, your home is probably your most valuable investment. The roof which covers it usually represents 5-7% of the homes cost but covers and protects 100% of the structure itself and your contents. 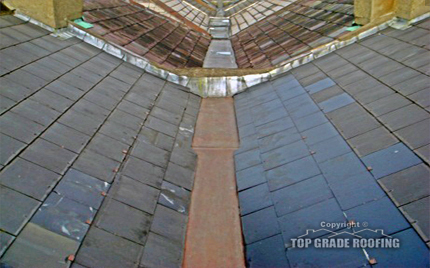 Top Grade Roofing have no call out charge and issue free estimates with no obligation. Think of it as an annual health check for your home. 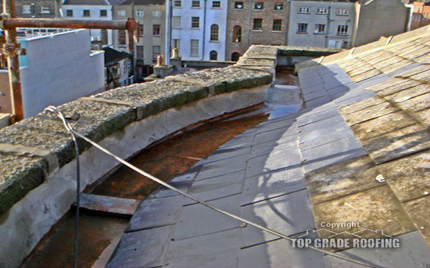 Call us on 085 779 5818 for all roof cleaning, maintenance, and repairs now.